Today we went out to my home town to see Onermark Grams. It had been some time since we had last been out there as a family and thought a day outside of the apartment would be great. While there we helped with a few chores. The first chore we tackled was to bundle up all the dead wood grandma had cut down days earlier. 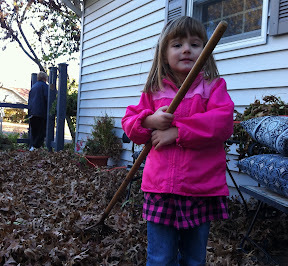 Alyce wanted to join in on the fun and started grabbing single sticks and depositing them in the yard waste bag. Every time she'd find a stick Alyce would say "I found another one" and drop it off. Later she noticed that I was cutting sticks down to size to fit better and she then wanted me to cut every one of her sticks in two because they were too big. Following the stick removal Mom and Alyce were taking turns running around the house. Hearing the giggles of a 4 year old as she runs around the house is probably one of the greatest sounds ever. The last job of the day was to rake some leaves and empty some pots on the back patio. 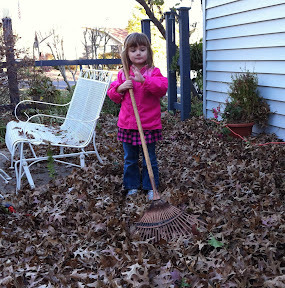 The leaves on the patio can get pretty thick and it makes for some great piles for kids to run through. While we were moving around the table and chairs Alyce too a shot at raking a few leaves herself. She had mixed success but we appreciated the effort and it made for some cute pictures. 0 comments on "Helping Grandma"